It's been a while since I've introduced a new feature here on the Book Mine Set, but this one's been stuck in my brain for a while now. As those of you know who follow my Saturday Word Play feature, I've got a thing for trivia. However, sometimes working trivia into a word game, doesn't always succeed. So, I figure that I might as well do a separate trivia feature. I won't be scrapping SWP all together, but some weeks I'll feature Trivial Sunday, some weeks I'll feature Saturday Word Play, and some weeks I won't feature anything. Despite rumours to the contrary, I still have a life outside this blog. 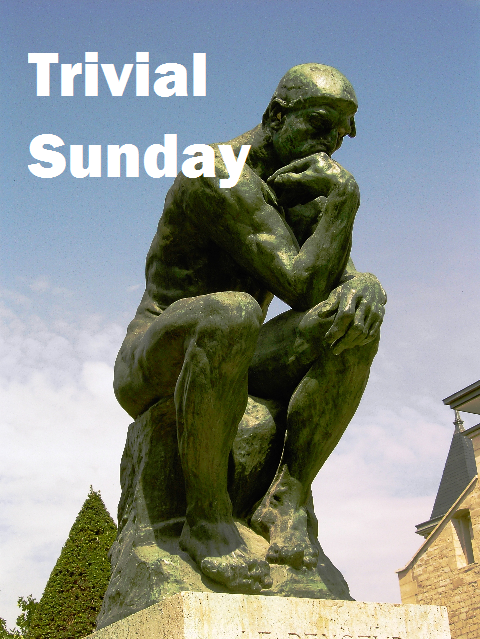 This week's Trivial Sunday features the Tragically Hip and highlights their literary connections. I'll throw out 10 questions, ranging from easiest to hardest (in my opinion). Answer them all at home, but only answer one in the comment section below to allow multiple people a chance to play along. Check back later to see if you got it right! 1. Who is the song "Courage" dedicated to in its subtitle? Just to see how much bad luck you really get"? 3. Name Gordon Downie's book of poetry. 4. Which song, from the album In Violet Light, shares its name with a a graphic novel by Seth? 5. Which Biblical couple is mentioned in "When the Weight Comes Down"? 6. Which Washington Irving locale is referenced in "Don't Wake Daddy"? 7. Which Giller Prize winner was thanked in the liner notes for We Are The Same, and with his wife, penned a press release for the album? 8. Which title by Farley Mowat is mentioned in "The Depression Suite"? Well, you're a sober and green-eyed Voltaire"? 10. A lyric from the song "Use It Up" from In Violet Light is attributed to which American short story author and poet? I know the answer to number 2; Cordelia. I love trivia almost as much as I love the Hip, so I look forward to the new addition to your blog. I definitely picked the easiest question. Love the Hip, but I've not followed them closely, or owned all their albums. Can't go wrong with trivia. I love trivia and look forward to further episodes of this feature. PeachyTO: That's it. One of their classics. Bonus points for telling me another Shakespeare character named in the titles of songs by The Band and by Moist. Raidergirl: Bingo. And a passage from which MacLennan novel finds its way into the song? Pooker: Yes. No fair, you should roll down the windows! Can you also tell me two Hip songs named after Boyden's current home? Follow up questions? sheesh, make it difficult. I would not have guessed this without external assistance, but The Watch That Ends the Night. I would have gone with Barometer Rising or Two Solitudes, so I've learned something new. Great new feature! Nice to switch things up every once and awhile. I'm going to answer number 3: Coke Machine Glow. Raidergirl: Okay, you're off the hook. It was indeed The Watch That Ends The Night. Allison: Good job. Follow-up: Coke Machine Glow also had a solo project cd of the same name. His next solo cd did not have a book of poetry. What was the name of his 2nd cd? Ah, I've been beat on the follow up. I can recall hearing about this one too but cannot recall the name. I will have to turn to Google. Allison already took the only question I could answer. Obviously I am a poor Canadian, based on my TH non-knowledge. Well poo, I could only come up with half the answer to your bonus question. I got New Orleans is Sinking without too much head scratching but had to Google for the second song. So I guess I know a tidbit and a tid about Hip trivia.